The Showboat casino gives players that little bit of Mardi Gras excitement on the Atlantic City Boardwalk. Showboat has a very good position on the Boardwalk, so is in easy walking distance to lots of other attractions. The casino claims to have the loosest slots in Atlantic City, meaning that a lot of players head their to get the best value for money possible. The hotel is popular for its roof top pool and excellent fitness facility. 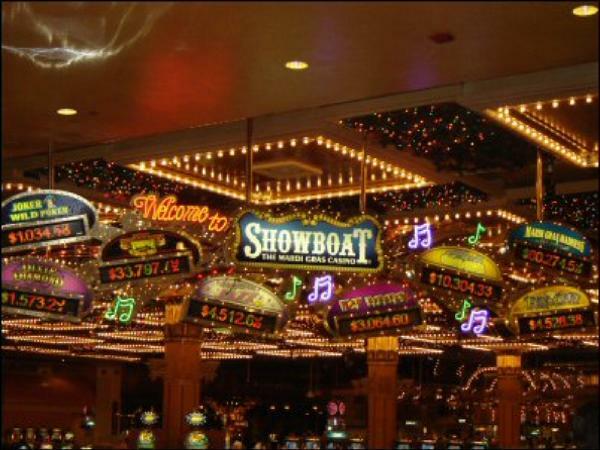 The Showboat is famous for its relaxed fun attitude and that holds true for their dining experience as well as their gaming. One of the most popular and most fun restaurants at The showboat is Johnny Rockets, the famous 1950s-style burger bar. The service there is top-notch and if you're lucky you might even get to experience the staff singing and dancing some rock and roll classics. Showboat also has an Earl of Sandwich restaurant, which is open 24 hours. They offer some of the best sandwiches around - hot and cold. As with quite a few of the older, classic hotels on The Boardwalk, the rooms are great value, but at the same time, could do with a bit of an update. It's one of those situations where you get what you pay for and if value for money is important, or you will be spending most of your time out and about, then Showboat could be a good option for you. "We had a real blast at Showboat, playing the slots and eating at Johnny Rockets Diner. The location is right on The Boardwalk, so no need for taxis and you are right in the middle of everything. Rooms could do with a makeover, but they were still good value. No room safe was the only thing we really were not happy about. Apparently, they are installing them soon? " The casino at Showboat, atlantic City is quite low-key, but at the same time, it does have its charms. There are plenty of low-stake tables to play at and the staff on the games are friendly, which makes all the difference. There are plenty of slots on offer, although they do not have quite a few of the lastest games. That said, this means that if you love the classics, then you will most likely still find them at Showboat. The selection of older games on the casino floor is great if you love real penny slots, rather than the ones that pretend to be pennies, but cost a lot more every time you spin the reels. Drinks on the casino floor come in plastic cups, rather than glass and the beer I ordered was also in a plastic cup.